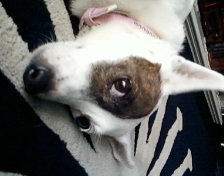 Our Dog Penny the Jack Russell! 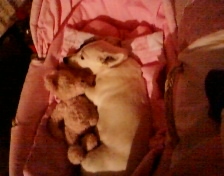 I had had my dog Benji all his life since a teanie, tinie puppy. He used to come inside my bed when he was very small.I used to spend all my time with him,and he used to come every were with me.We loved walks all over,down to the boating bridge to see the ducks and even up to the shops with me.He had a huge back garden and loved the sun in the summer.Running up and down in his own little part of the garden,untill teatime.And he would come in and snuggle up to me in bed.Untill he got bigger as he was a border colly cross.And he had to sleep in his own bed in our huge kitchen. We had Benji till he was 18 years old and he became ill,and in the end we had no choice as to have him to sleep.So he could be at pice.It was so,so hard for us all.But now we still have all our happy memories. A year or so later we decided to get another pet dog,although Benji would never be replaced, as any dog never dose. But mum wanted me to get a smaller dog. So we saw little Penny for sale. I rang the lady up who was selling her and said I could go round to see her.Straight away,I thought she was so sweet.The ladie told me she couldn't keep her as she couldn't deal with a dog and the children, as she was having another child too. 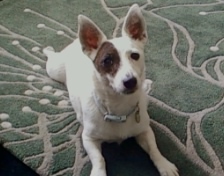 I felt so sorry for her as a dog is part of the family,and wasn't the dogs fault. So I bought her, took her home and loved her forever,just like we did with Benji.Penny is so human.She knows when Im happy and when I'm sad. She opens the car electric windows on her own,and barks when she needs the loo. 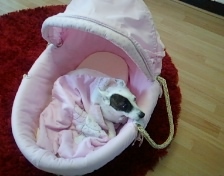 She sleeps with me in her little sleeping bag,or sometimes in her own babies crib. Shes so spoiled and she knows it!